Between 20,000 and 60,000 bees live together in a bee nest. Beaver lodges have secret underwater entrances. Around 30% of the sand around the Great Barrier Reef could be parrotfish poo. Discover these facts and hundreds more in How Animals Build by Moira Butterfield and Tim Hutchinson. This super engaging lift-the-flaps book for kids explores the amazing home-building talents of animals from around the world. Learn how animals set up their homes, what building materials they use (and where they get them from), how creatures, big and small, set up security measures to keep them safe from predators and so much more. There are so many fun facts to discover in this book, and the kids will love folding out pages and lifting flaps to discover the secrets hidden within. The information presented is easy to read, easy to understand and, above all, it’s interesting. Awesome for school assignments or impressing friends with cool animal facts. 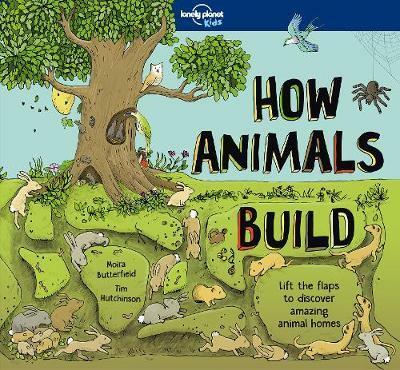 And with bright and funky illustrations throughout, How Animals Build is also fun to explore and highly engaging for children (and adults). The pictures are colourful and detailed, achieving a perfect balance of realism and cuteness. An information book kids will willingly reach for, this is a fabulous resource to add to your home, classroom or school library.